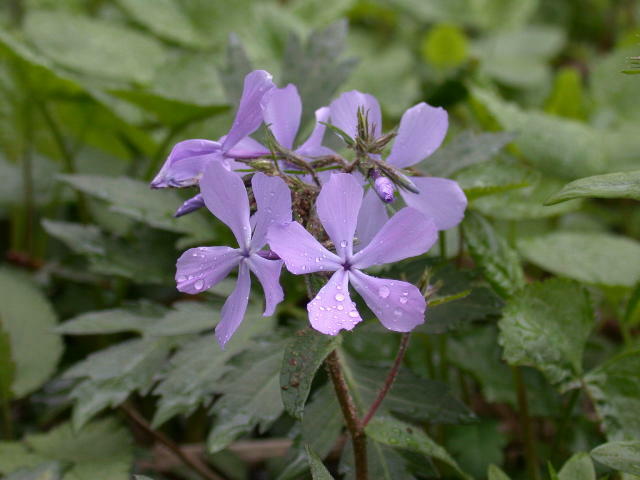 Blue Phlox (Phlox divaricata): Grows everywhere. Prefers shade. These were at the foot of Seneca Rocks, MNF, WV, near the bridge. Close-up by Ken Clark at Great Falls NP, MD. 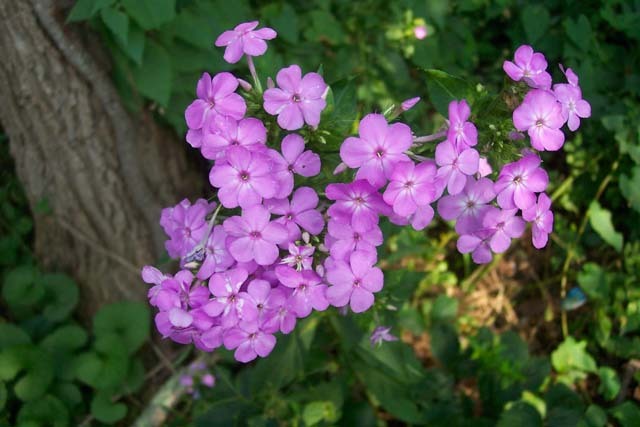 Garden or Fall Phlox (Phlox paniculata): Similar to other phlox but with wider petals. Blooms July-October. Found along edges. Has been cultivated. Location: Kaymoor Top, New River Gorge NR, WV. 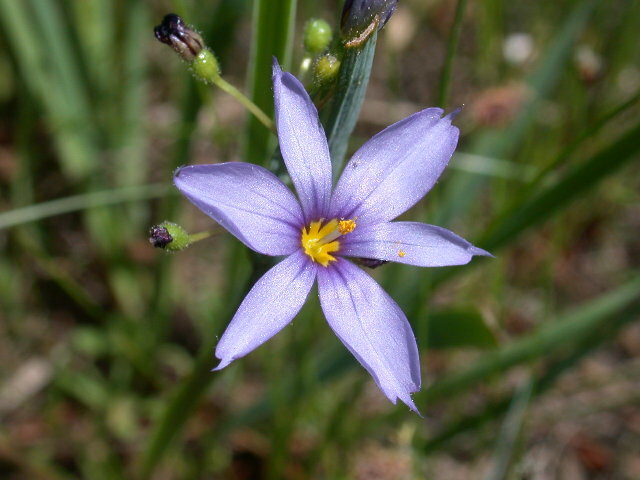 Common Blue-eyed Grass, Sisyrinchium montanum: Actually in the Iris Family. 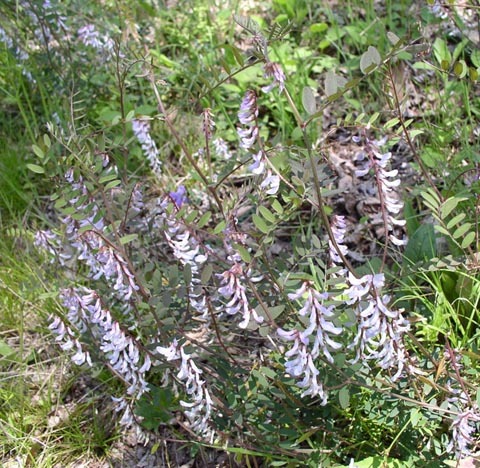 Blooms in late spring in open areas. Photo by Ken Clark. 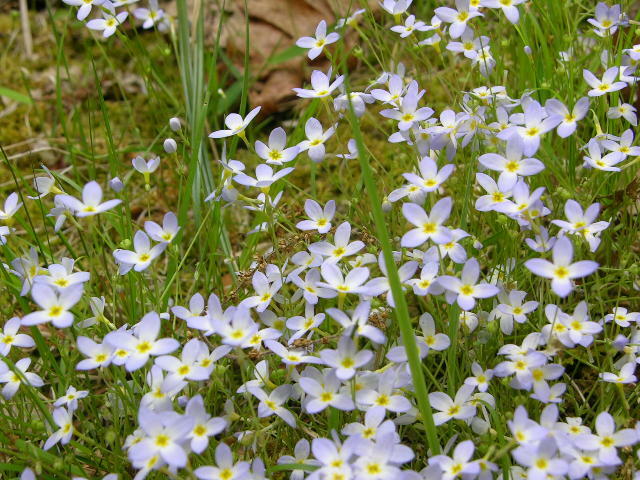 Bluets (Houstonia caerulea ): Tiny, soft blue flowers with yellow center. 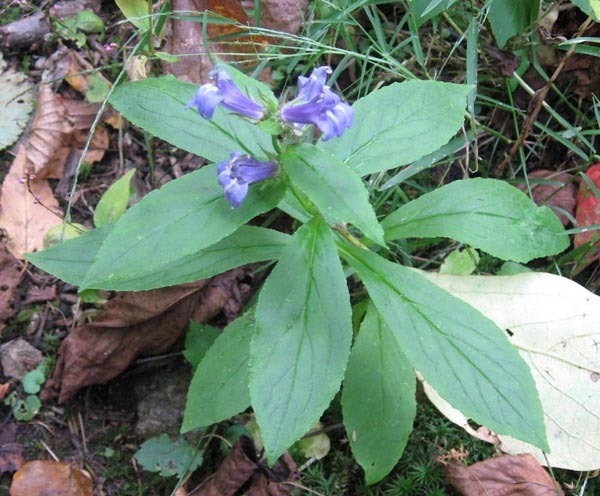 Often found in colonies in open grassy woods. Photo by Ken Clark. Large Houstonia (Houstonia purpurea): Pale orchid with darker "tubes". Several flowers in terminal clusters. Location: Old Rag. Photo by Ken Clark. Wild Geranium (Geranium maculatum): Another shade-loving plant. Varieties differentiated by the breadth of the leaf lobes. Location: the parking area marking the northern terminus of the North Fork Mt. Trail, MNF, WV. 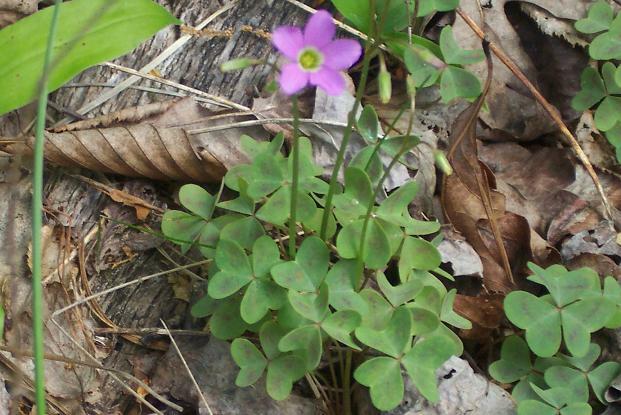 Violet Wood Sorrel, Oxalis violacea: Grows in open areas along roadsodes and in open woods. Location: Massanutten Tr, VA. True Forget-me-nots (Myosotis scorpiodes): An alien. 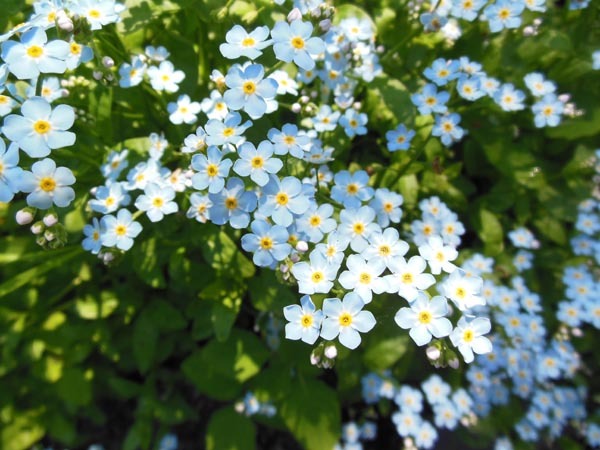 Little blue flowers with yellow centers. Flower has 5 petals. Bluets only have 4. Photo by Dave Bennick. Small Flower phacelia, Phacelia dubia: Grows in open woods. 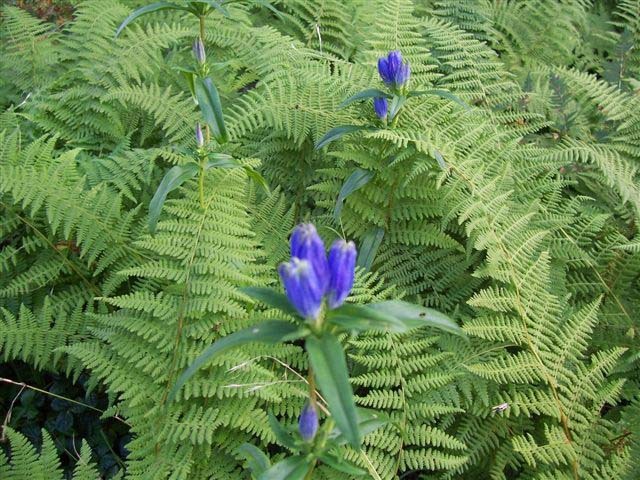 Can be found in thick clusters or large plantings. Flower is purple/blue w/green centers when they first bloom. Fade to pale blue or white with age. Location: Jeremy's Run Tr, SNP, VA. Round Leaf Hepatica (Hepatica nobilis var. obtusa ): Also found in white, pink and purple. Not uncommon to find mixed colors in one patch. Grows trail-side along streams and creeks. These were along Piney Run in SNP, VA but we saw similar ones on Jeremy's Run. Bloom in April. Aneilema (Murdannia keisak). I originally misidentified this as Virginia Day Flower (Commelina virginica - L). The photo file still carries the misnomer. Jan Meyer corrected me. 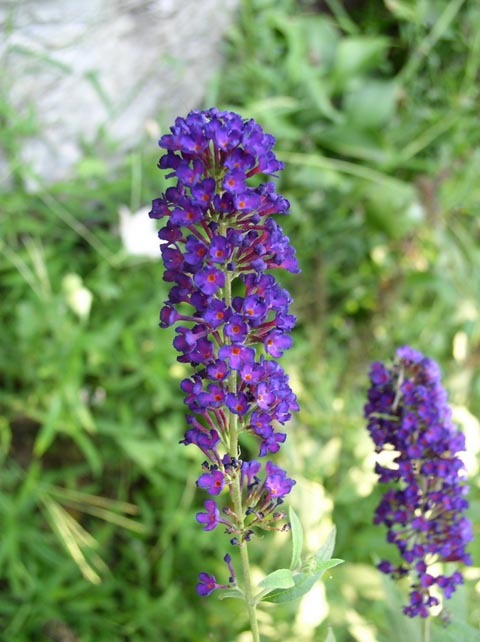 It is considered a noxious, invasive plant in many states. Grows along streams. 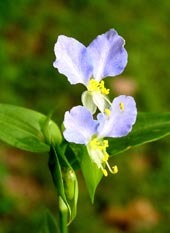 Location: Goshen Pass, VA.
Asiatic Dayflower (Commelina communis): Introduced from Asia. The flower lasts only a day hence the name. Note the smaller white petal. Location: Under the New River Bridge, WV. 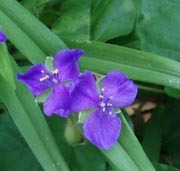 Spiderwort (Tradescantia virginiana): Common in woods, roadsides, disturbed areas. Location: Olmsted Island, C&O Canal National Historic Park, MD. 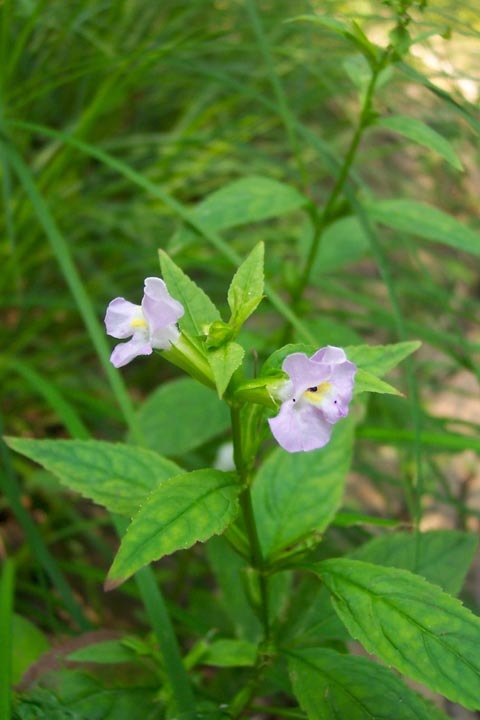 Square-stemmed Monkey Flower (Mimulus ringens): Prefers Marshy/wet areas. Similar to M. alatus that has "stemmed" leaves. Location Fifteen Mile Creek Tr, Greenridge SF, MD. 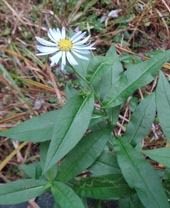 Lowrie's Aster (Symphyotrichum lowrieanum, syn. Aster lowrieanus) White to pale blue. Note the flat winged leaf petioles. This is specific to this variety of aster. Woodlands. Location: World's End SP, VA.
Purple-stemmed Aster (Symphyotrichum puniceum, syn. Aster puniceus). Hairy, purple stem. Leaves envelope the stem. Location: South Prong Trail, Roaring Plains, WV. New York Aster (Symphyotrichum novi-belgii, syn. 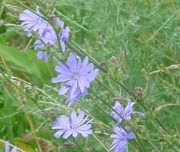 Aster novae-belgii ). 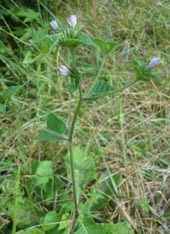 Similar to the Purple-stemmed Aster (above) except the stem is green and hairless. 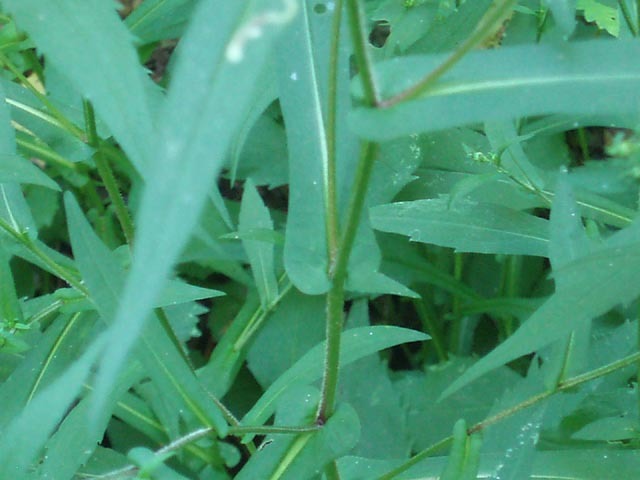 The basal end of the leaves do not envelope the stem. Location: Lebanon Reservoir, PA. Photo by Bill Maurer. Crooked-stemmed Aster (Symphyotrichum prenanthoides, syn. 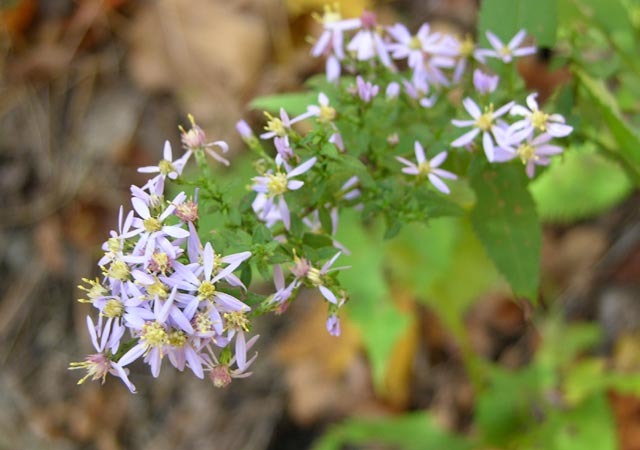 Aster prenanthoides): Purple stem changes direction at every leaf axil. Flowers white to pale blue. Leaves usually stemless. Location: Roaring Plains, WV. 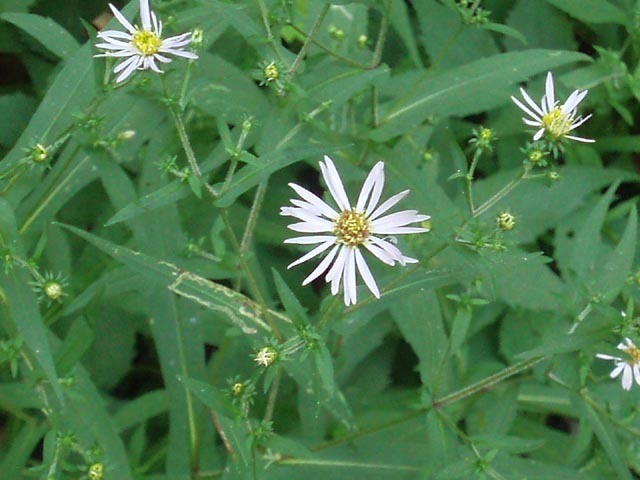 Heart-leaved Aster (Symphyotrichum cordifolium, syn. 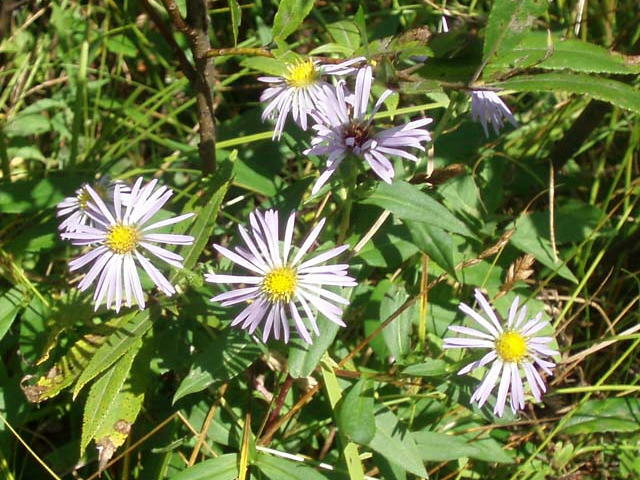 Aster cordifolius): Dense terminal clusters of pale blue-violet flowers. Stems smooth. Lower leaves toothed and heart shaped. Location: Little Devil's Stairs, SNP. Photo by Ken Clark. New England Aster (Symphyotrichum novae-angliae, syn. Aster novae-angliae): Blooms July-Sept. Location Dolly Sods North, WV. 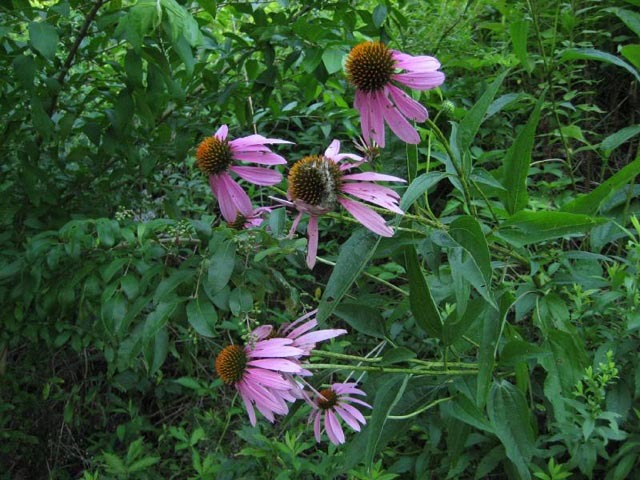 Purple Cone Flower (Echinacea purpurea). 2-3 feet tall. Blooms June to October. Location: PA. Photo by Michelle Molina. 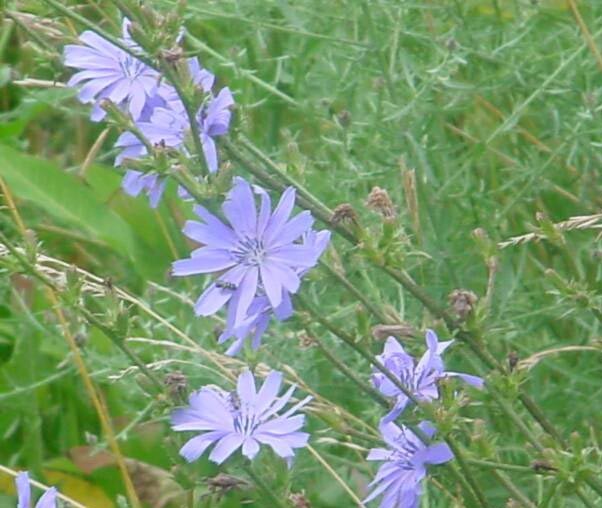 Chickory (Cichorium intybus): Introduced from Europe. Stalkless flowers on long stems. Basal leaves. Petals are square-tipped and fringed. Found along roadsides, fields, waste places. Roots ground and used as a coffee substitute or additive. Photo by Anita Mueller. Common Violet (Viola papilionacea): There are many varieties of violets. This is the most common. Blooms April through the summer. Location: Laurel Run Trail, Great North Mt., GWNF, VA.
Violet/ Pastel Blue variant: There are so many different kinds of violets. 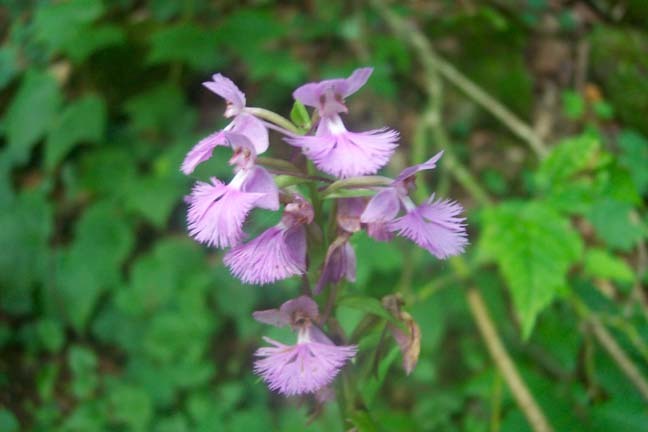 Shenk's Ferry Wild Flower Preserve in the Holtwood Recreation Area, PA boasts of at least 5. Prefer shady and moist areas. Bird's Foot Violet (Viola Pedata): This little pansy-looking gem gets its name from the irregular leaves. Prefer open, sunny areas. This specimen was found along Old Town Rd in Green Ridge State Forest, MD. 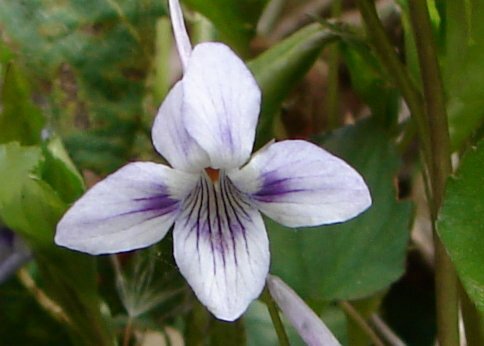 Long-spurred Violet (Viola rostrata): Pale blue with darker lines in the bottom three petals. Long Spur. Blooms April to June. Photo by Patrick Roberts. Location: Allegheny Trail (North section), WV. 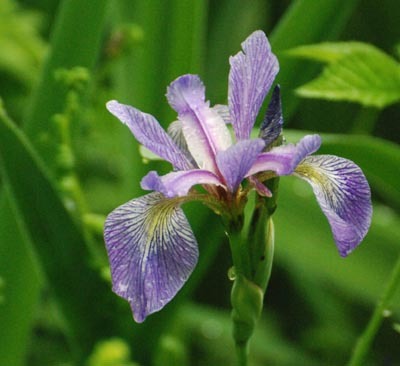 Slender Blue Flag (Iris primatica) - 1-3 ft. Leaves grass-like. Found in marshy areas. Blooms May - July. Photo by Ken Clark. Larger Blue Flag (Iris versicolor): Broader petals and leaves than the above Slender Blue Flag. Grows to 3 feet. Found in marshy areas. Photo by Anita Mueller. 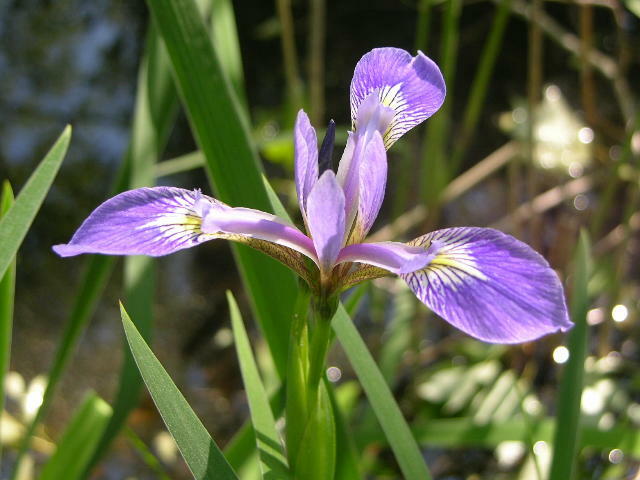 Dwarf Iris (Iris pumila): There are at least 2 dwarf Iris in our region. I believe this is the plainer but still beautiful I. verna. Blooms April-May. Location: all along Laurel Run Trail, North Mt. 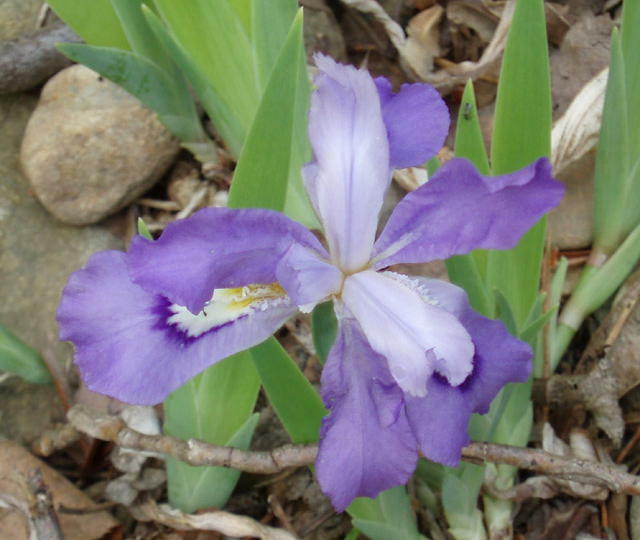 Trail and Stack Rocks Trail, GWNF, VA.
Crested Dwarf iris (Iris cristata): 3-8 inches. Wet areas. Location: AT, James Face Wilderness, Matthews Creek. 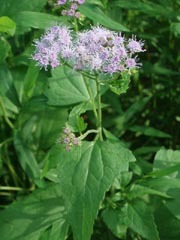 Hoary Mountain Mint (Pycnanthemum incanum ): Light violet flowers at the ends of stems or in the leaf axials. Soft blue-green leaves with white underside very appealing. 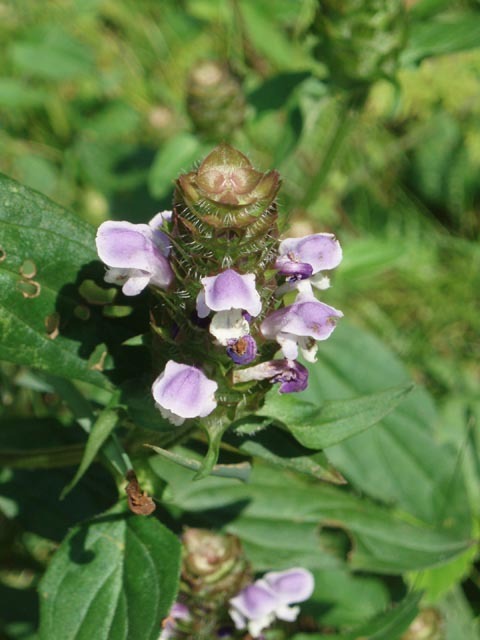 Location: Range View Cabin on the AT, SNP, VA.
Heal-all, Selfheal (Prunella vulgaris): In the mint flower. Alien. Found along roadsides and trails. 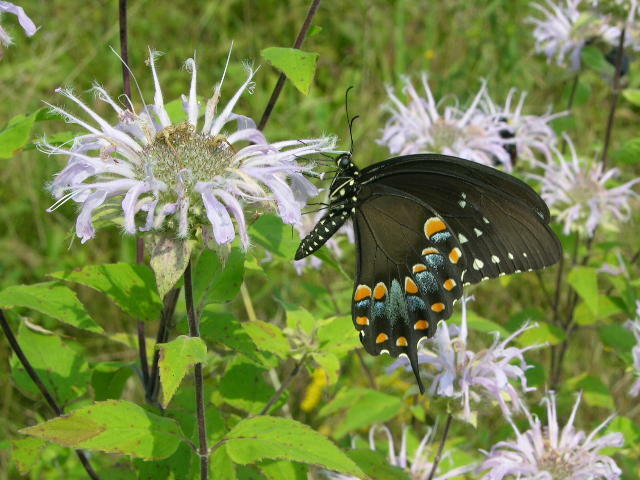 Location: Quehanna Wild Area, PA.
Wild Bergamot (Monarda fistulosa) w/Spice Bush Swallowtail Butterfly: Found in open fields and edges. Cultivated. Location: Long Pond Trail, GRSF, MD. Photo by Ken Clark. Beefsteak Plant (Perilla frutescens): Alien. Originally from Asia. Used as an ornamental and in the culinary arts. Very invasive. Location: Morgan Run N.E.A., MD. 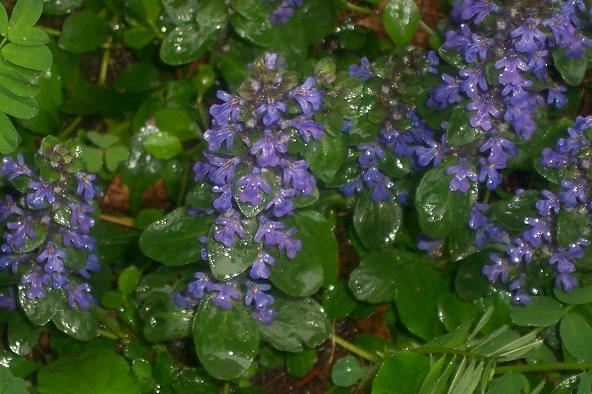 Ground Ivy (Glechoma hederacea): Grows along the ground. Most often ecountered in our lawns as a weed. Photo by Ken Clark. European Horsemint (Mentha longefilia) An Alien. Aroma similar to but weaker than Spearmint. Leaves much longer than Spearmint or Peppermint. Photo by Dave Bennick. 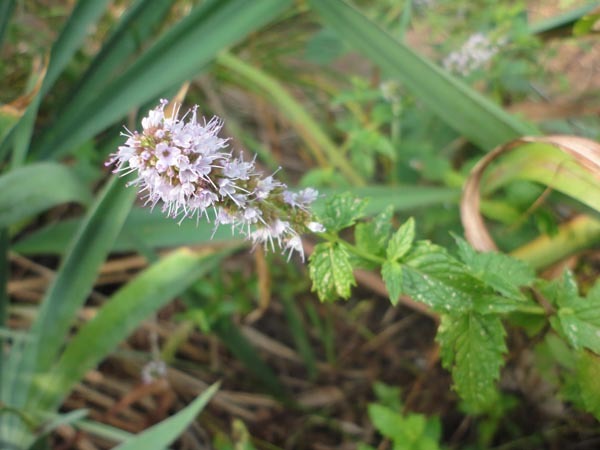 Spearmint (Mentha spicata): Compact long flower head. 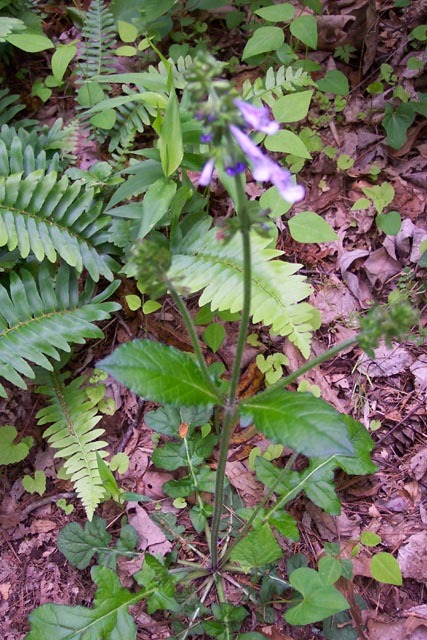 Small (to one inch), crinkly, sessile (w/o stems), paired leaves . 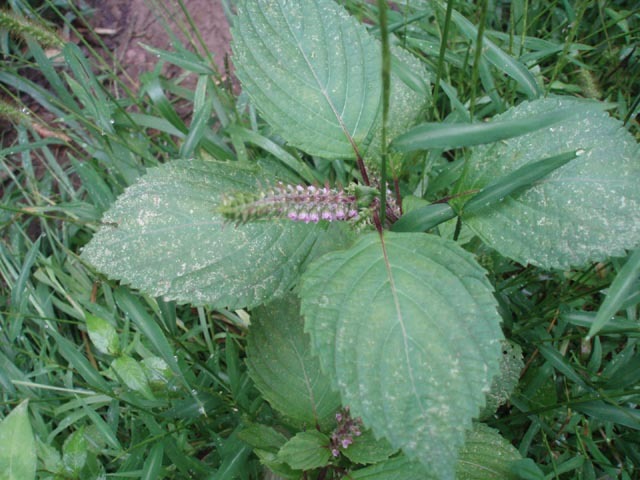 Hybridizes with Water Mint (Mentha aquatca) to make Peppermint (Menta piperita). 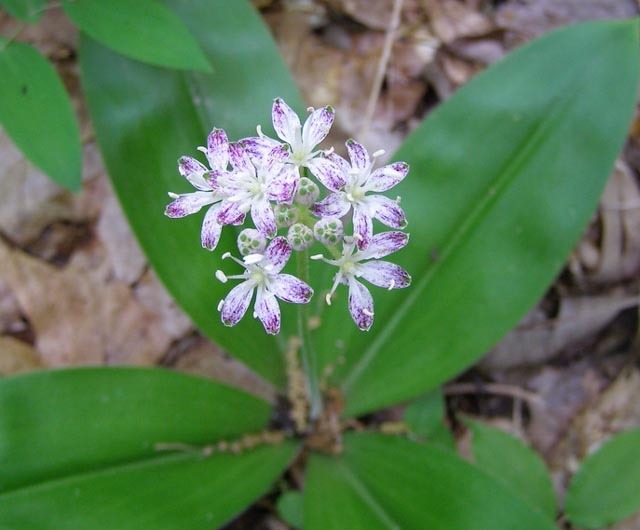 Speckled Wood Lily (Clintonia umbellulata): Most often white but frequently speckled with purple as seen here. Photo by Dimitri Tundra. 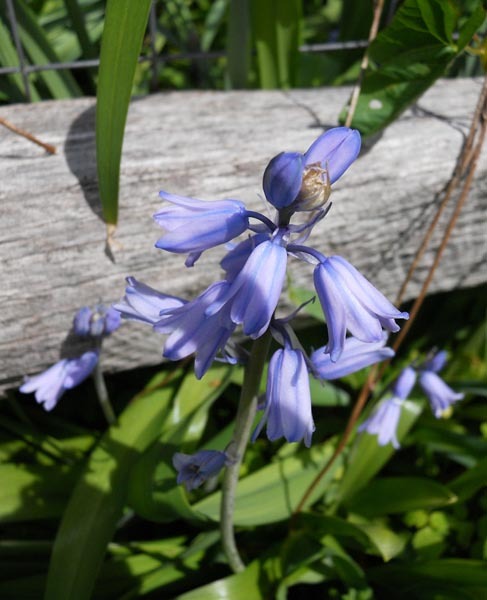 Harebell (Campanula rotundifolia): Large, hanging violet/blue flowers on a stiff naked stem, small oval basal leave. Photo by David Bennick. 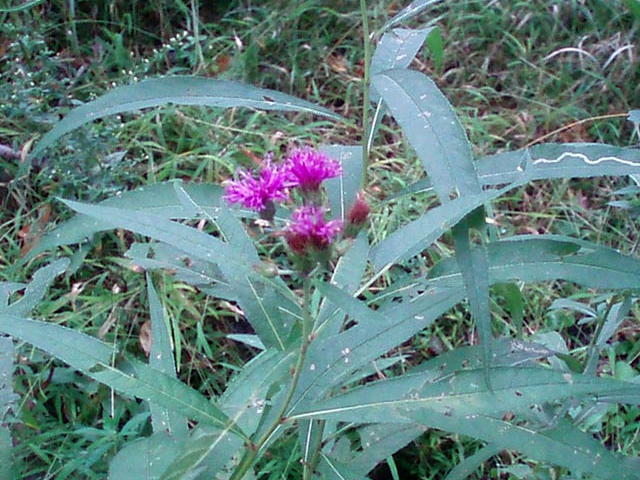 New York Iron Weed (Vernonia noveboracensis) - Grows in thickets it wet areas and low spots. Blooms August to October. Grows 3-6 feet. 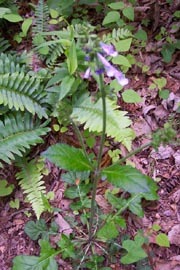 Location: Gifford Pinchot SP, PA.
Lyre-leaved Sage (Salvia lyrata): Clusters of violet to blue tubular flowers atop a sturdy stem with lanceolet upper leaves and multi-lobed basal leaves. It's purple leaved cousin w/pink flowers grow in my garden. Location: Jeremy's Run Tr, SNP, VA. Bottle (Closed) Gentian (Gentiana andrewsii): Only large bumble bees can force open the petals that are always closed. Blooms in late summer through the first frost. Location: South Prong Trail, MNF, WV. Photo by Pam Wyatt. : Blooms late April, early May. Location: C&O Canal between Fifteen Mile Creek and Lock 58. 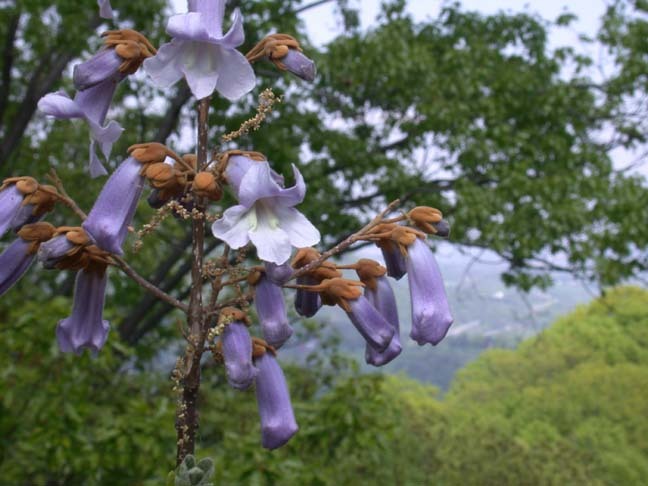 Empress or Princess Tree (Paulownia tomentosa): An escaped ornamental tree. Because of its ability to grow anywhere it is considered an invasive. Location: Harpers Ferry, WV. Photo by Ken Clark. 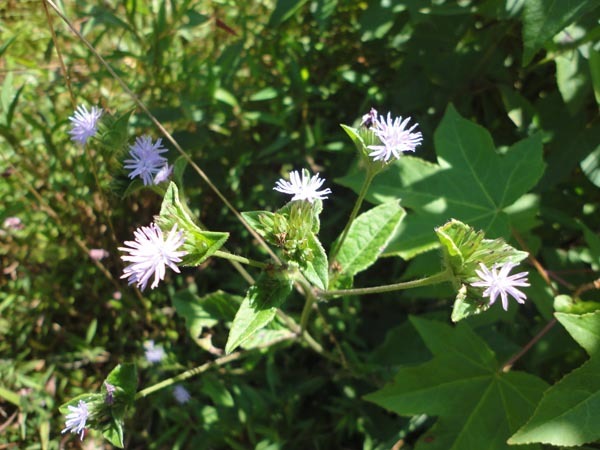 Blue Mistflower (Eupatorium coelestinum): The only blue Eupatorium. Note the paired arrow-shaped leaves. Location: Downs Park, MD. Carolina Elephant's Ear (Elephantopus carolinianus) Erect, branching plant with hairy stems and leaves. Loose clusters of violet-blue flowers supported by three leafy bracts. Habitat open areas, meadows. Location Downs Park, MD. 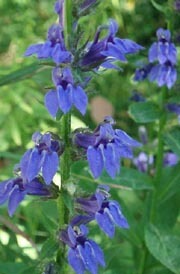 Great Lobelia (Lobelia siphilitica): Elongated Clusters of odd-shaped purple flowers. As the name implies, it was thought to cure syphilis. Location: Beulah Trail, MNF, WV. Bugle or Bugleweed, Ajuga reptans: Both a wildflower and cultivar from the mint family. Reproduces by underground runners. 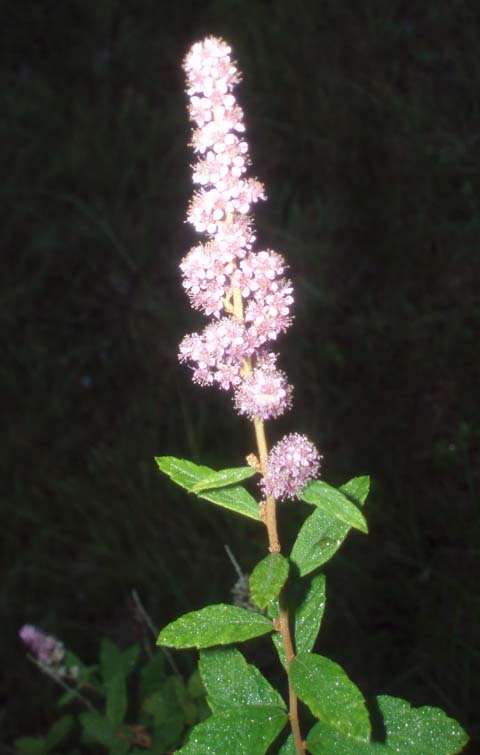 Location: Black Moshannon SF, PA.
Steeple Bush (Spirea tomentosa) - Note the tight spiral of flowers at the top. It blooms and withers from the top down. Found in old fields, meadows and along roads. 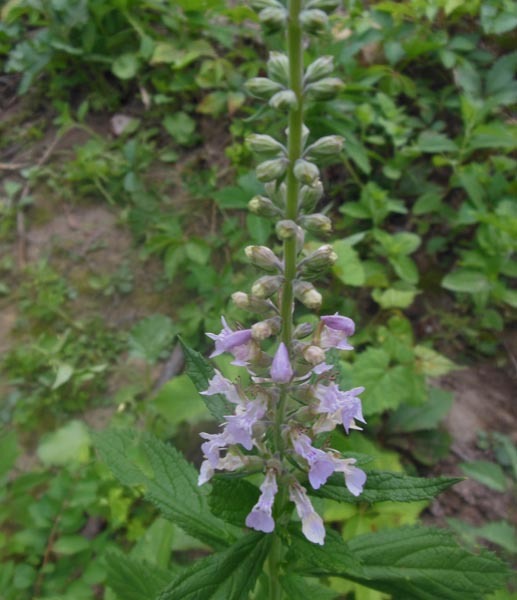 Location: Quehanna Tr, PA.
Hyssop Skullcap (Scutellaria integrifolia): Prefers clearings and edges. 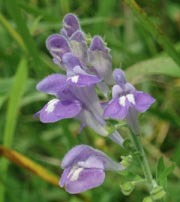 Its small, narrow leaves set if off from other Skullcaps. Location: Blue Ridge Center for Environmental Stewardship, VA.
Showy Skullcap (Scutellaria serrata): Large, serrated oval leaves. Photo by Dave Bennick. 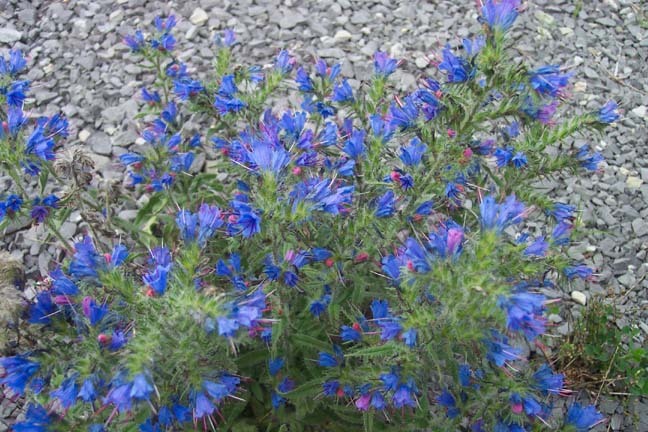 Viper's Bugloss or Blueweed (Echium vulgare): Introduced from Europe in the 1600's. Some consider it a weed, others an important wildflower. Incredibly blue tubular flower with contrasting red stamens. Flower branches uncurl as flowers bloom. Location: Highland Scenic Highway, MNF, WV. 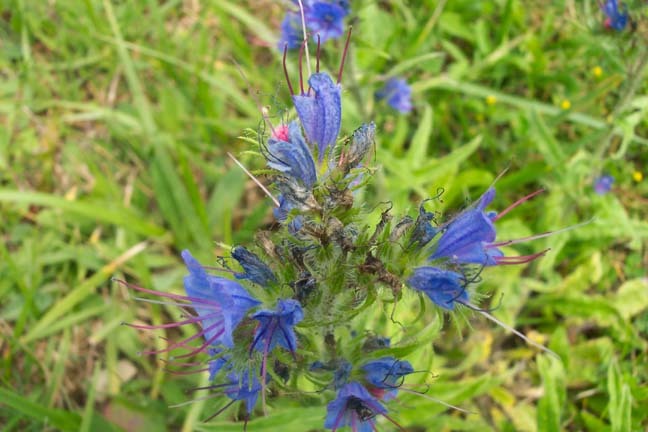 Paterson's Curse, Salvation Jane, Riverina Bluebell, Purple Bugloss (Echium plantagineum or E. lycopsis (syn)): Often mistaken for its cousin,Viper's Bugloss (E. vugare), above. It was initially introduced from Europe. Found along roadsides and waste areas. 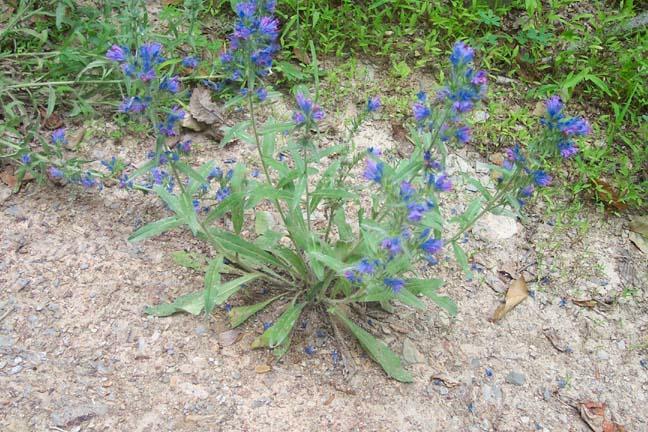 Although it is an attractive plant it is listed on several state and the federal lists of invasive and noxious plants. It has totally overtaken many pastures in Australia. Skin irritation can occur from touching the hairs on the leaves. It is considered poisonous to children and small pets. Now also found in Canada. 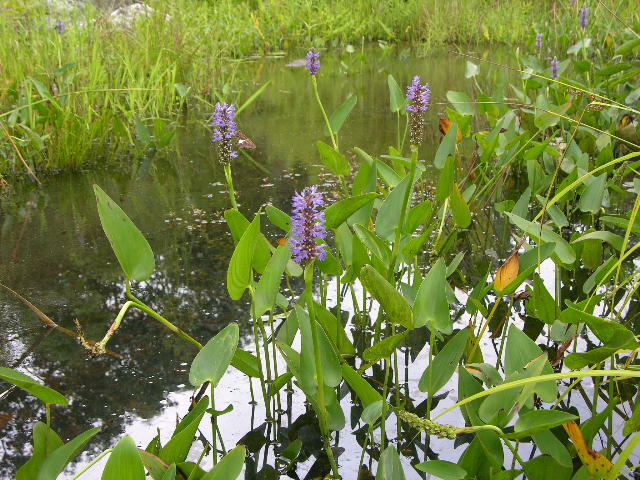 Pickerelweed, Pontederia cordata: A true acquatic. Can grow 2-3 feet tall. Location: Billy Goat Tr, Great Falls NP, MD. Photo by Ken Clark. 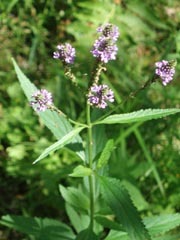 Swamp Verbena/Blue Vervain, (Verbena hastata): Grows in wet areas. 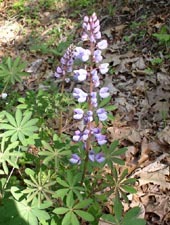 Location: Shingle Mill Tr, Black Moshannon State Forest, PA.
Wild Lupine (Lupinus perennis): Open woods and clearings. In the pea family. Photo by Dimitri Tundra. 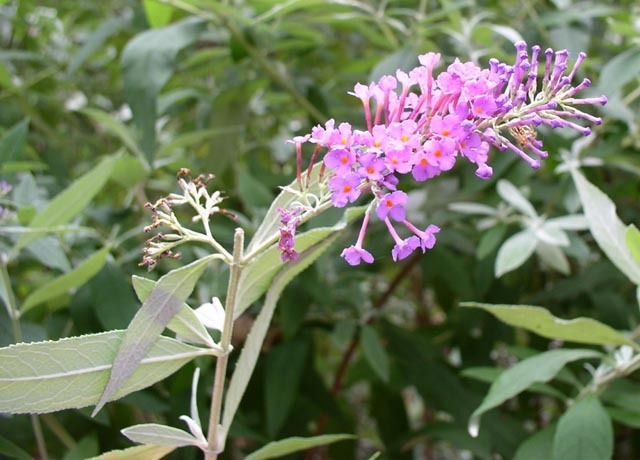 Butterfly Bush (Buddleja davidii): This is a naturalized domestic that can be found in several colors growing in the wild. All will have the tell-tail orange throat. Attracts butterflies and hummingbirds. Photo by Dimitri Tundra. Wood Vetch (Vicia caroliniana): A sprawling vine of dry woodlands. 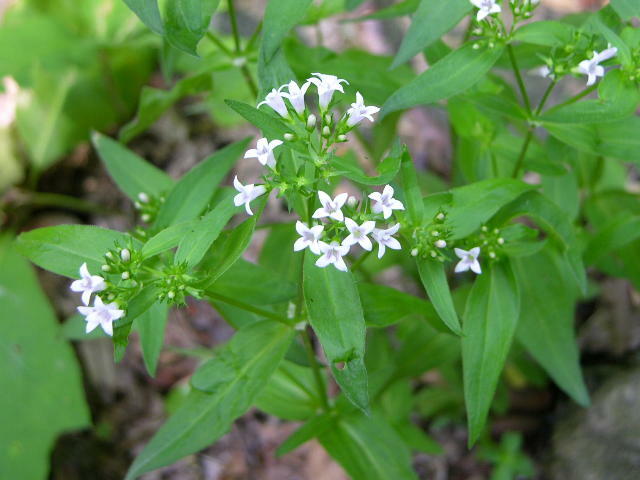 Often white with a blue tinge at the base of the flower. Photo by Dimitri Tundra. Cow Vetch / Tufted Vetch (Vicia cracca): Common vetch but individual plants can be striking. Location: Neighbor Mt Tr, SNP, VA. 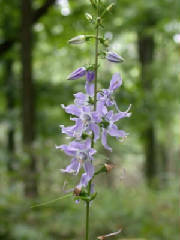 Tall Bell Flower (Campanula americana): Grows to about 3 feet in deep woods. Summer bloomer. Location: Piney Ridge Trail, SNP, VA. Photo by Ken Clark.